Quick ‘n’ Chewy Crescent Bars also won the Pillsbury Bake-Off in 1972 (there were 2 winners that year – according to Wikipedia). Recipe on Pillsbury.com by Isabelle Collins of Ramona, California. Are they quick? Yep! Are they chewy? You betcha! 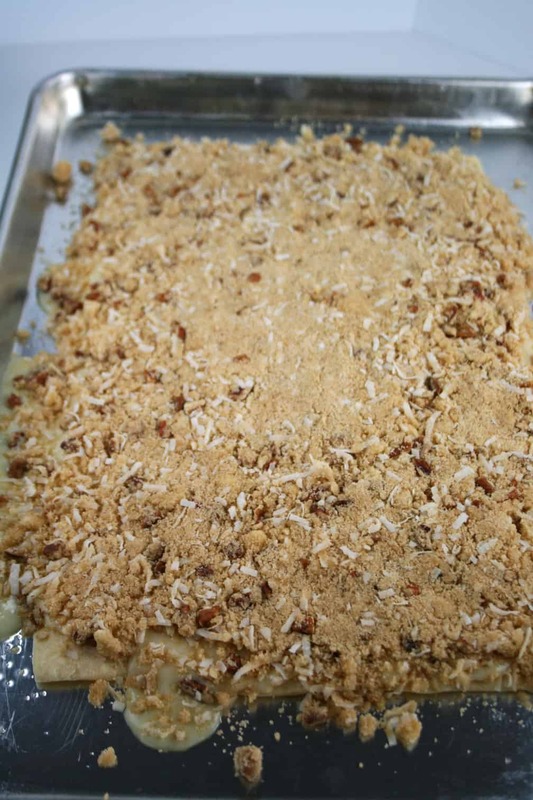 Start by making the coconut and nut topping. 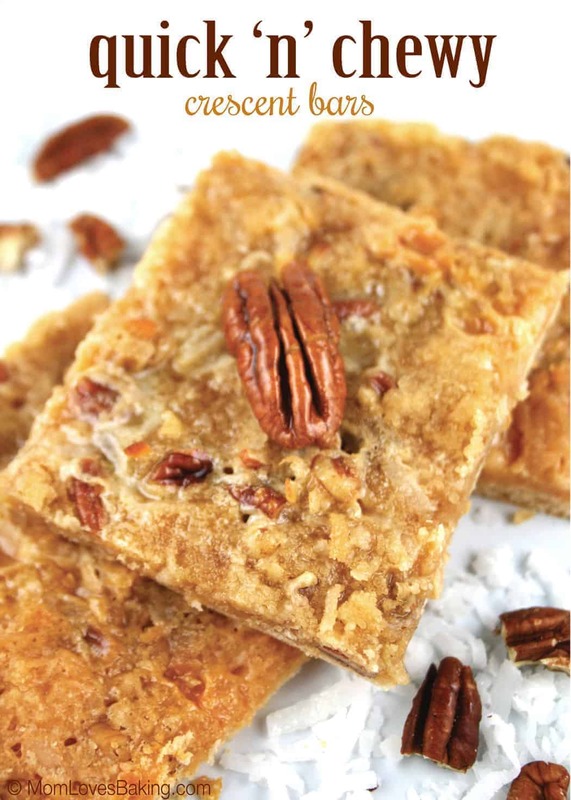 In medium bowl, mix flour, coconut, brown sugar and pecans. Cut in butter, using pastry blender (or pulling 2 table knives through mixture in opposite directions), until mixture looks like coarse crumbs. Set aside. Then you get out the crescent dough. 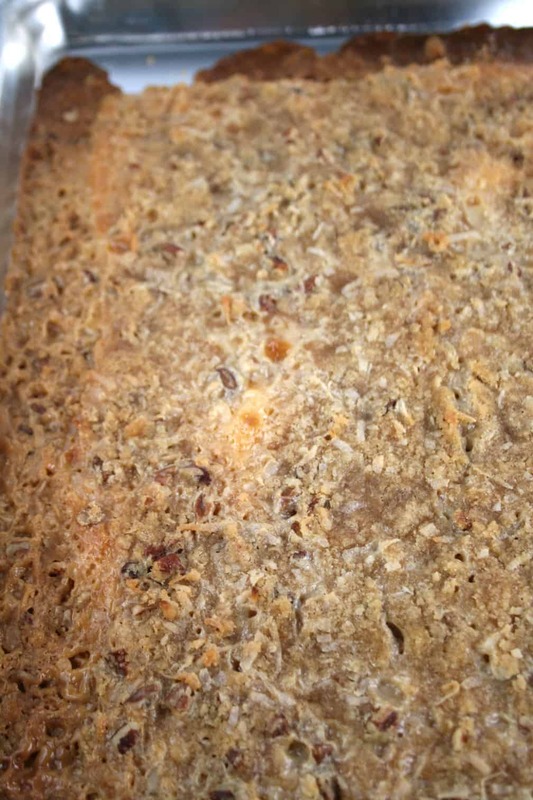 Unroll dough into 2 long rectangles. Place in ungreased 15x10x1-inch pan; gently press dough to cover bottom of pan. Firmly press perforations to seal. (There’s also the option to use the dough sheet. If that’s the case: Unroll dough; cut into 2 long rectangles.) Place in ungreased 15x10x1-inch pan; gently press dough to cover bottom of pan. Pour condensed milk evenly over dough to within 1/2 inch of edges. Sprinkle coconut mixture over condensed milk; press in lightly. Bake in a preheated 400°F. oven for 12 to 15 minutes or until deep golden brown. Cool completely, about 1 hour. They look a little bit messy, but once you cut them into bars, all is well. For bars, cut into 8 rows by 6 rows. And there you have it. Quick ‘n’ Chewy Crescent Bars. 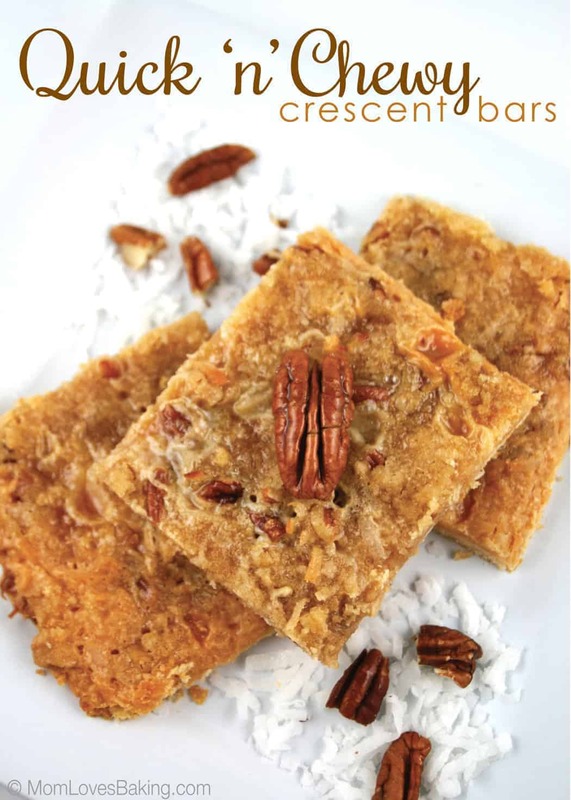 It’s almost like a German chocolate cake filling in bar form with no chocolate but oh so good. Heat oven to 400°F. In medium bowl, mix flour, coconut, brown sugar and pecans. Cut in butter, using pastry blender (or pulling 2 table knives through mixture in opposite directions), until mixture looks like coarse crumbs. Set aside. If using crescent rolls: Unroll dough into 2 long rectangles. Place in ungreased 15x10x1-inch pan; gently press dough to cover bottom of pan. Firmly press perforations to seal. If using dough sheet: Unroll dough; cut into 2 long rectangles. Place in ungreased 15x10x1-inch pan; gently press dough to cover bottom of pan. 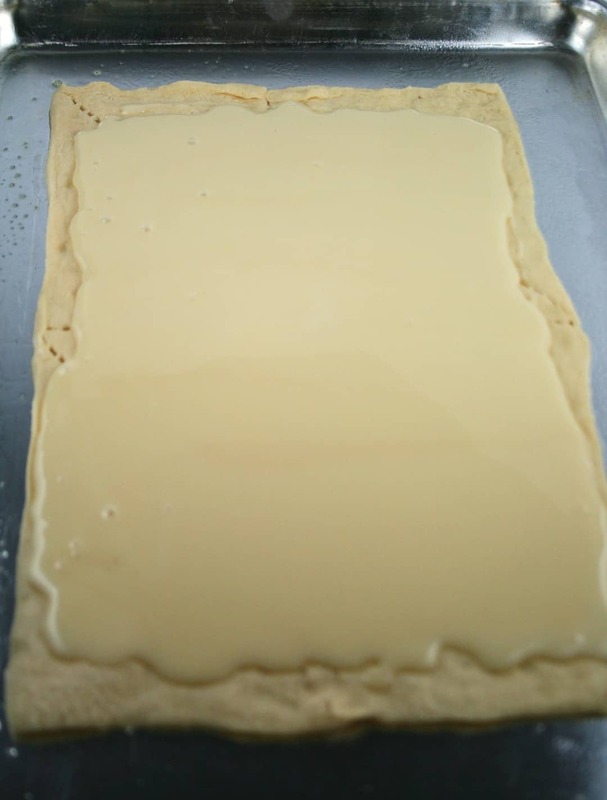 Pour condensed milk evenly over dough to within 1/2 inch of edges. 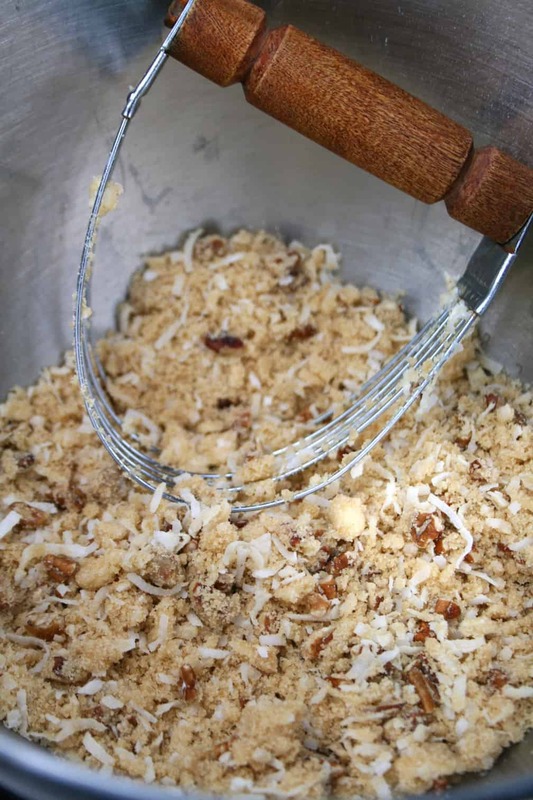 Sprinkle coconut mixture over condensed milk; press in lightly. Bake 12 to 15 minutes or until deep golden brown. Cool completely, about 1 hour. For bars, cut into 8 rows by 6 rows. I found this recipe back in 1972 when it first came out. It called for a can of coconut pecan frosting, which they no longer sell. I haven’t made it since, but that doesn’t mean I can’t. I am sure the fresh ingredients is just as good.